The Plumas Ski Club began operation of the Plumas-Eureka Ski Bowl at it's present site during the season of 1957-58. 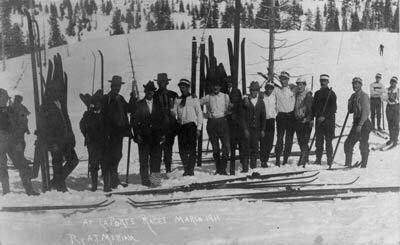 However, the history of skiing in the Plumas County area of the northern Sierra dates back to 1860. Very few people realize that this distinguishes the mountains between Johnsville and LaPorte as the oldest recorded sport skiing in the western hemisphere. During the later portion of the 19th century, historic towns in Plumas and Sierra counties including LaPorte,Howland, Flat, Port Wine and Johnsville served as popular winter playgrounds for skiers. Only the Johnsville area continues to serve both locals and visitors as a site for the increasingly popular Nordic and telemark style skiing as well as alpine and downhill skiing. By 1863, Gold Mountain, now known as Eureka Peak, above the then thriving mining town of Johnsville had a down-the-hill ski run of 2600 feet. An early day "longboard" ski racer was reported to have reached a speed of 90 mph. According to oral history, the mining ore buckets going up Gold Mountain were used by skiers as possibly the first ski-lift in the world. In 1937, two young Quincy men designed the first real ski lift in Plumas County. Unfortunately, they built the lift on the lower slopes of Mt Washington in an avalanche path. The lift was eventually relocated to the steep slopes behind the Plumas-Eureka StampMill. At one time the present Plumas-Eureka State Park museum served as a ski lodge. In 1950 the Plumas Ski Club was organized as a non-profit organization by skiers from Blairsden, Portola and Quincy. The Ski Club was involved in promoting both downhill and cross country skiing and ran a rope tow near the museum until 1954. In 1955 the Ski Club moved the rope tow to the present site in Eureka Bowl which had historically been used for skiing in the 19th century. Over the years, members of the Ski Club have contributed money and labor to develop the Plumas-Eureka Ski Bowl. As years passed, a warming hut was built and the lifts were expanded to include the present day poma lifts. In 1959, Plumas-Eureka Ski Bowl became part of the state park.